See the press release below and please support this important cause. RAIN’s Trinity Project, The Red Pump Project, and CW Williams Community Health Center invite mothers, daughters, and girlfriends of the Queen City to come out for free self-empowerment, HIV/AIDS awareness and education workshops, and HIV/AIDS testing Saturday, March 10 from 9 a.m. until 3 p.m. at First United Methodist Church Fellowship Hall, 501 N. Tryon Street (click here to register). In addition to scheduled workshops, attendees will be motivated by the words of keynote speaker Kimberly Jowers, author of The Heart of Perfecting My Space (PMS)! 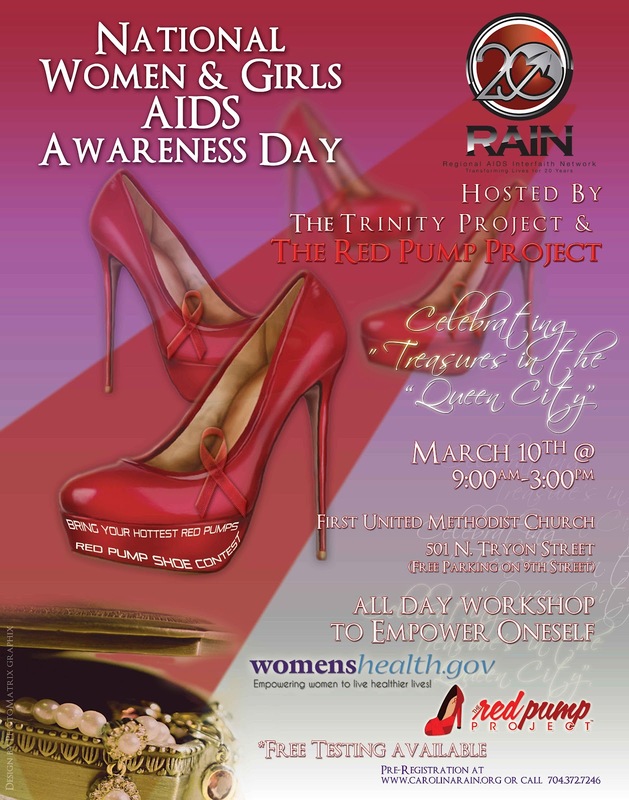 Ladies attending are encouraged to wear (or bring) a pair of red pumps to enter the Red Pump Shoe Contest, hosted by The Red Pump Project, a nonprofit organization that raises awareness and education about HIV/AIDS specifically aimed at women and girls. Photos of those in the contest will be posted on The Red Pump Project’s Facebook page. The Red Pump Project’s Facebook friends will vote for their favorite pair of pumps and the top five with the most likes will participate in the Red Carpet Walk Off. The crowd will choose the final winner, who will receive a Red Pump Gift Pack. According to the Centers for Disease Control, in 2009, 57 percent of total new HIV infections among women were among black women and 18 percent were in Latina women. The rate of new HIV infections among black women was 15 times as high as that of white women and more than 3 times as high as that of Latina women during that year. The reasons why black and Latina women are more affected by HIV and AIDS than that of other racial and ethnic groups are not directly related to race or ethnicity, but rather to the circumstances that place these women and girls at greater risk of becoming infected with HIV. These circumstances may include stigma, fear, discrimination, and limited access to high-quality health care. CW Williams will be on-site to provide information on their HIV/AIDS Program and other health services. This event is just one of many that will be held around the country to honor National Women and Girls HIV/AIDS Awareness Day on March 10, a national awareness day coordinated by the Office on Women’s Health (OWH), within the Office of the Assistant Secretary for Health at the U.S. Department of Health and Human Services. Its goal is to encourage people to take action in the fight against HIV/AIDS and raise awareness of its impact on women and girls. This National Women and Girls HIV/AIDS Awareness Day, OWH is partnering with the Greater Than AIDS campaign and asking, “What’s your deciding moment?” According to Greater Than AIDS, deciding moments are everyday opportunities to take action against HIV, whether it is getting tested, talking with friends and family, using condoms, practicing abstinence, or taking medications as directed.